Fremantle veteran David Mundy is relishing the decision to play as a forward and believes the sea change could extend his career. 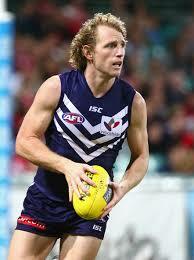 Mundy was one of Fremantle’s best during last Saturday night’s 16-point win over Essendon. The former captain collected 22 disposals, kicked two goals and had a game-high 10 score involvements while playing as a half-forward. Mundy’s vision, balance and precise disposal separated him from many others in what was a manic contest. It also showcased the versatility which has been evident during his time in WA. The Dockers drafted Mundy from Victoria as a key defender, he developed into a skilled half-back, then moved into the midfield where he earned All-Australian selection, won a Doig Medal and earned Norm Smith Medal votes. Mundy played as a forward at times last season and the 32-year-old said increased time in the new position had given him energy. “Trying to learn and master a new position is something that is a challenge and something I have enjoyed,” he said. “We’re trying to read the trends of the game. “It’s hard to play 22 games when you’re travelling every second week and getting pummelled in the midfield, especially at my age. “We decided to change it and I think it’s progressing well. “We’re seeing the trend with AFL football, with the interchange cap, and with our club drafting midfielders last year that I have to find my spot. The Dockers made one change to the team that beat Essendon for tomorrow’s clash with Gold Coast. Tommy Sheridan replaced Bradley Hill after the Doig medallist injured a knee during the final quarter against the Bombers. Sheridan managed only nine games last season, but his running ability will allow him to fill Hill’s role. Sheridan was an emergency last week and did not play in the WAFL. The Suns received a boost with the return of Pearce Hanley from a dislocated shoulder. He came into the team to replace Jack Bowes (suspended). Fremantle will release more seats for the game at 9am after a surge in ticket sales encouraged them to open the top level at Optus Stadium. Adult tickets for the top level can be bought for $30 and they are part of the offer which includes two free children’s tickets. Mundy said fans should do everything possible to attend. “It’s a show in itself. It’s not just a footy game,” he said. “It’s not often we get an extra game at home. We’re in a phase where we’re learning and trying to blood some young blokes.